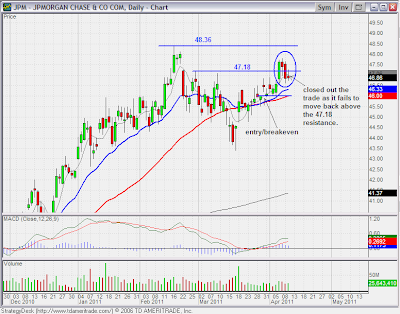 After successive failed attempts to move back above the 47.18 resistance baseline, the trade was closed out at 46.88 on 4/11/2011. This trade only returned a 0.61R. 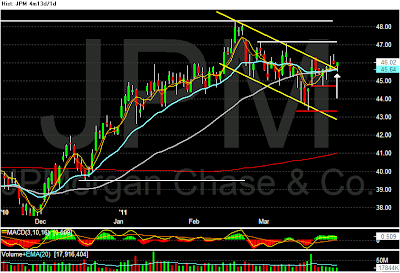 Scaled out 1/2 position size as it retraced back below the 47.18 resistance/support baseline when the market dipped on the news of another 7.1 earthquake shaked Japan. After today's move above the 47.10/47.20 resistance level, the stop has been moved to breakeven to avoid turning a profitable trade into a losing trade if this breakout turns out to be a fake out. A limit order to sell 1/2 the position near the baseline level of 48.36 will be placed to lock in some profit as it move through this level. 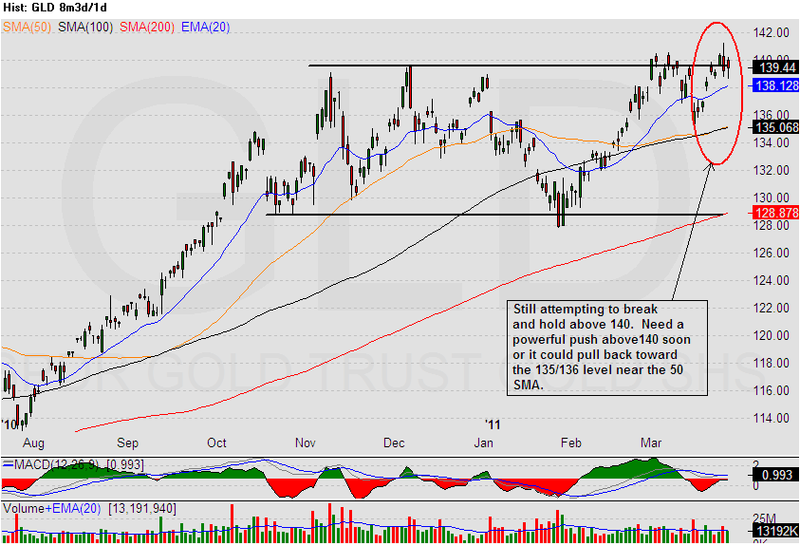 If a gap up open above this level, then a stop limit at 48.36 will be used instead of a limit sell order to protect the profit while letting it run for more. 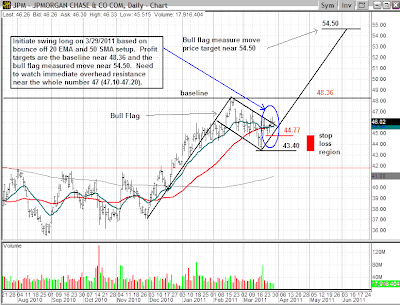 Click on the chart to get an updated view of the price actions. 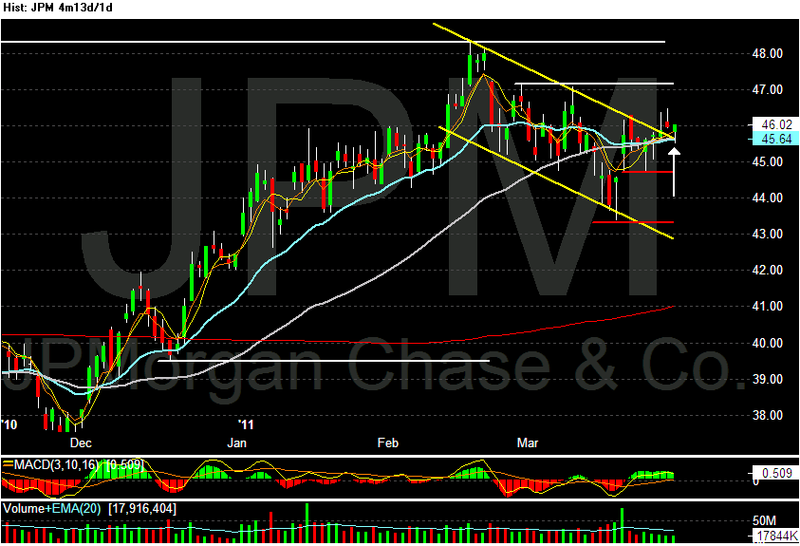 A long position on JPM was initiated today for a swing trade. 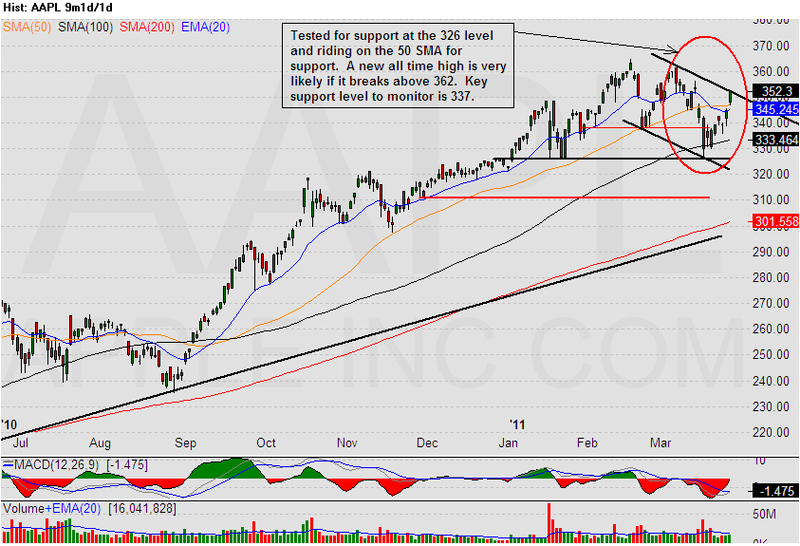 The setup is based on the bounce off the 20 EMA and the 50 SMA support. Today, a small bullish hammer candle formed with its wick penetrated below the moving averages and bounced back above it, then it closed near the high of the day. 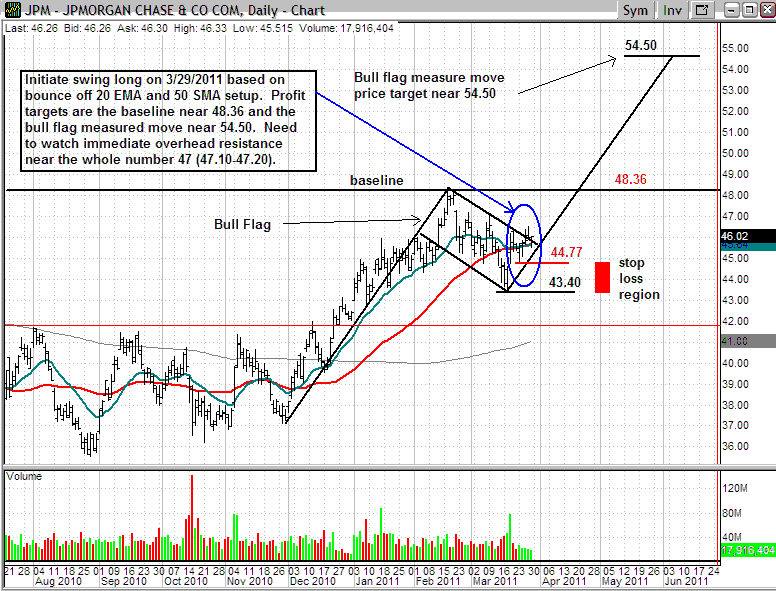 The initial price target is the baseline resistance near the 48.36 level, and the ultimate target is near the bull flag measured move level of 54.50. 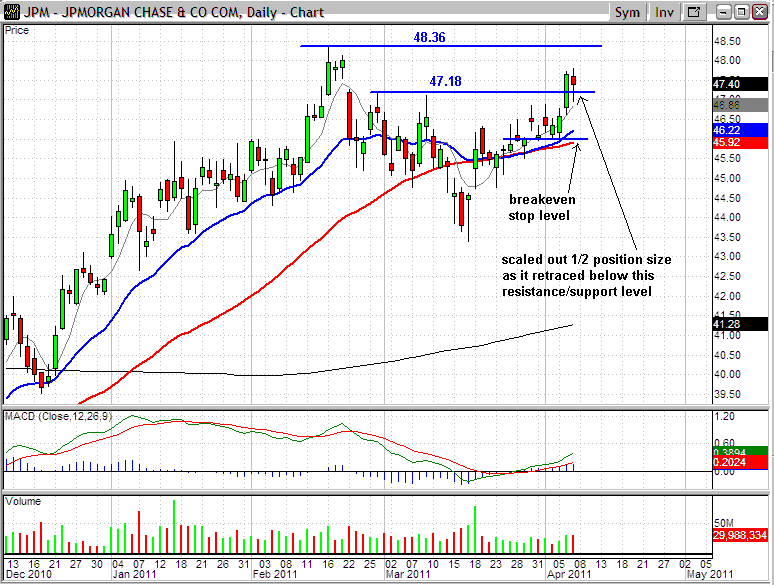 The position size is determined using a stop loss level between 43.40-44.77. 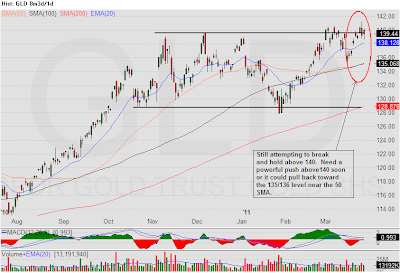 Here are the charts showing the various price levels being monitored for this trade. 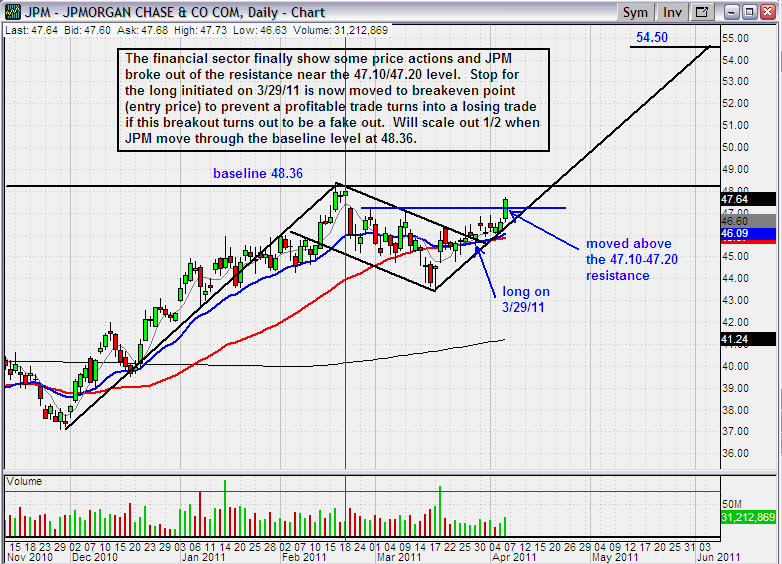 Click on the chart to get a zoom view of the chart. Updates will be posted when there are changes to this trade. After a week of sorting out the effects on Japan from its recent 9.0 earthquake, and the unsettled rebellious event in Libya, the market bounced back from its previous week low. 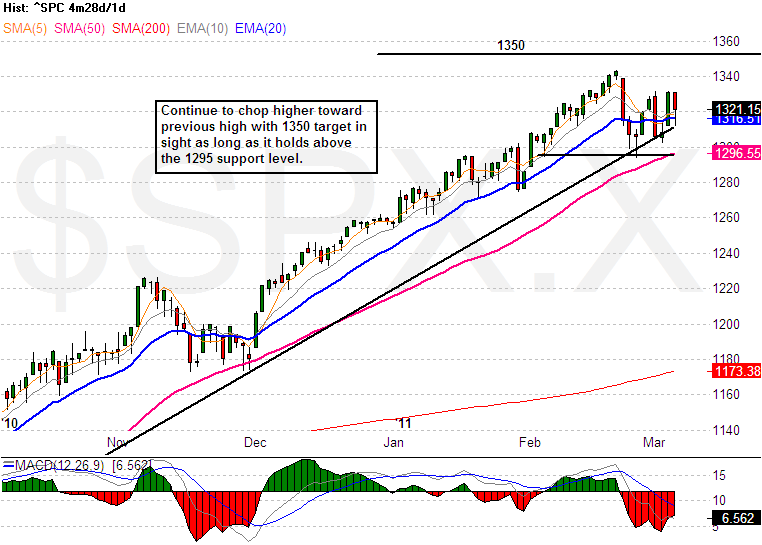 The SP500 moved back above the 1295 level and reclaimed the 50 SMA. 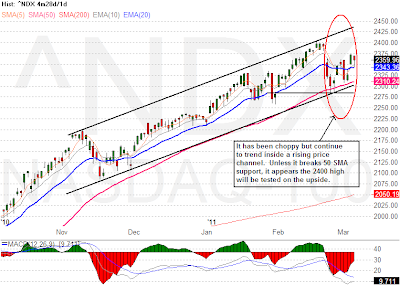 Similarly, the Nasdaq 100 also bounced back from its previous week low and moved back above its prior support level of 2275. 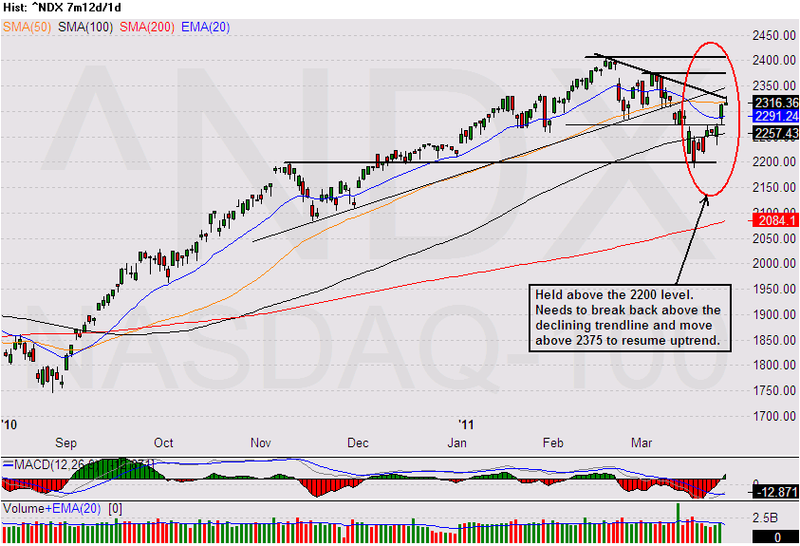 Last Friday, the Nasdaq 100 closed slightly below the 50 SMA after it hit a trend line resistance. 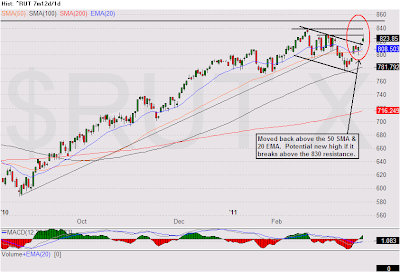 At the same time, the Russell 2000 bounced off its previous week low and broke out of a small price channel. 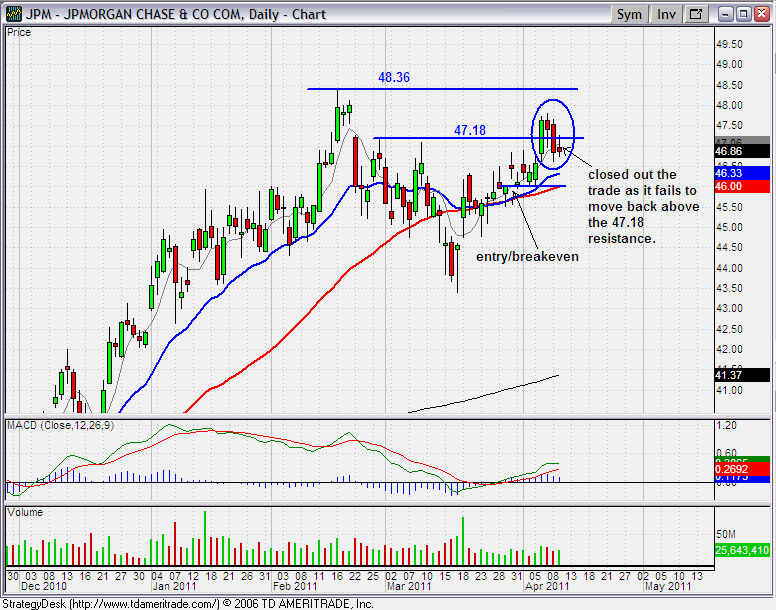 It even moved beyond the 3/3/11 high of 830.04 before it retreated back to close on Friday at 823.85. These price actions put the market at a crossroad. 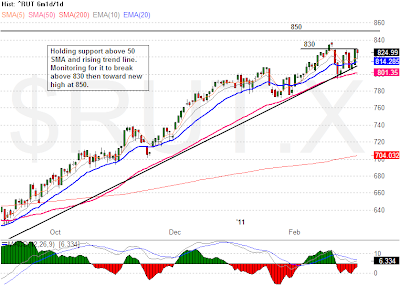 The major market indices are bumping against resistance and riding on their support. 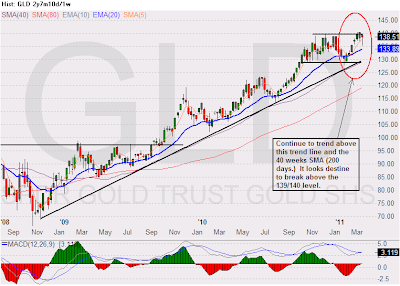 Depending on the catalyst in play for next week, this market could break above its resistance and resume its upward trend toward higher high, or it can roll over and go back down to retest its recent low. 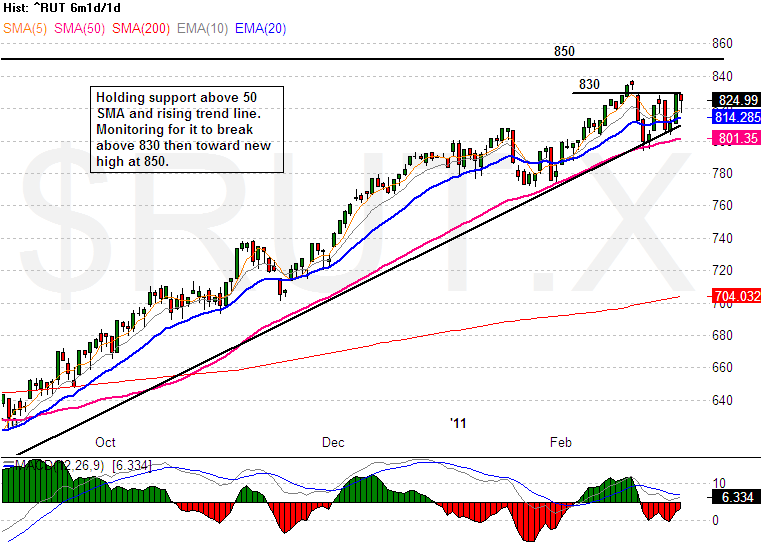 Many sectors are also showing recovery strength. 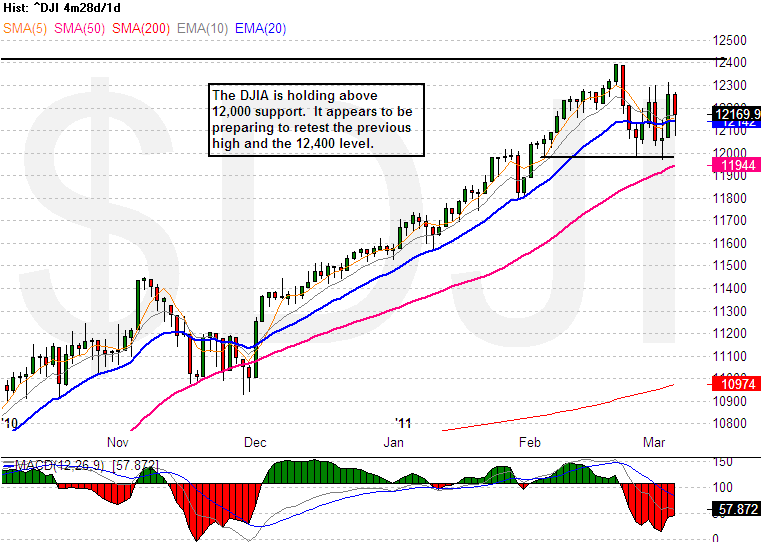 This seems to indicate it will be a broad base rally if it materializes. Next Friday will be another monthly job report. Depending on the tone of the market, this report could provide the tipping point for the future direction of the market. 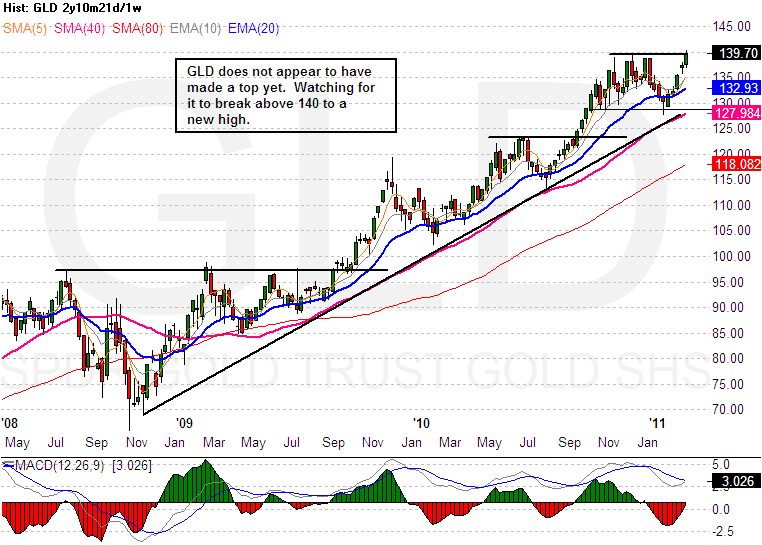 Gold is still flirting with the 1400 level, and its ETF, GLD is bouncing between 139/140. AAPL found support near the 326 and showing sign that it could be heading back up to make a new all time high. 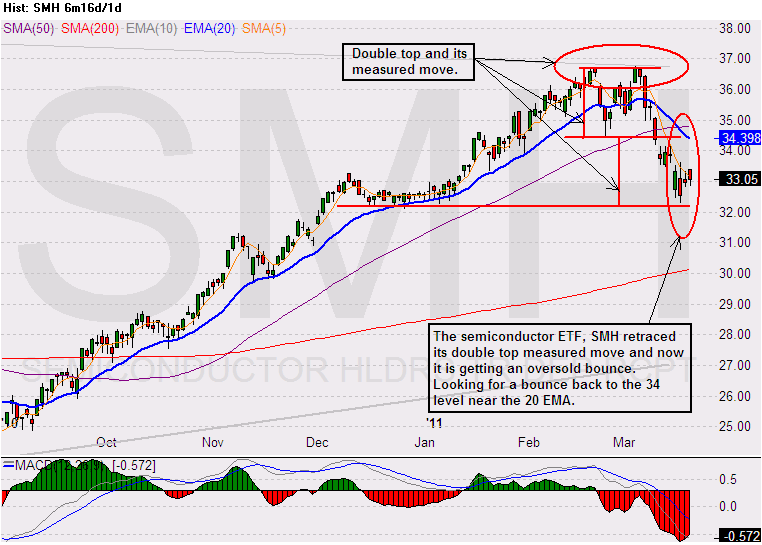 Even the semiconductor ETF, SMH is regaining strength. 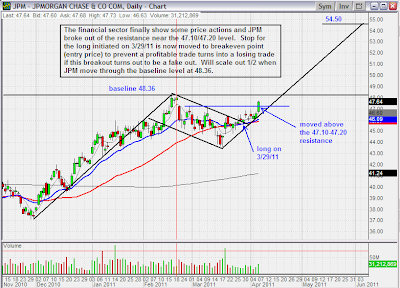 I will remind myself to be flexible while the market is at a crossroad and trade what I see not what I believe. The market will do what it will do…not what I or anyone else wants it to do. 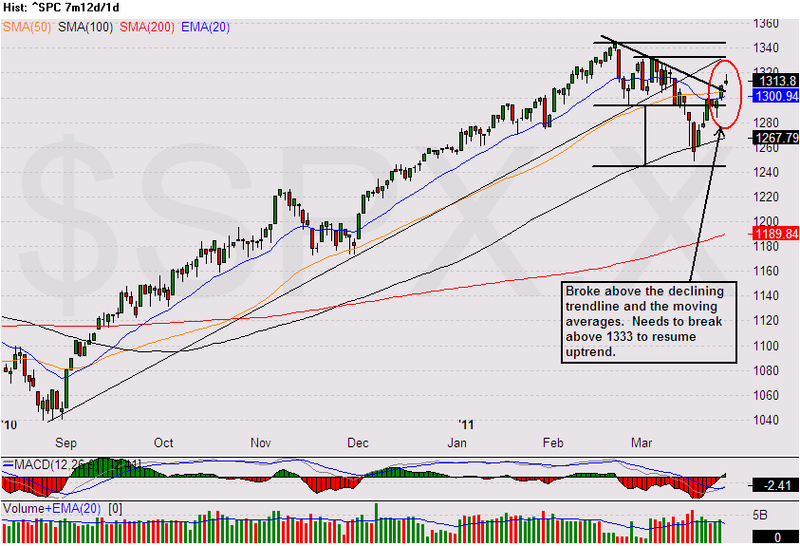 Until the market start to rollover toward the recent low, I will try to catch some swing long trades. 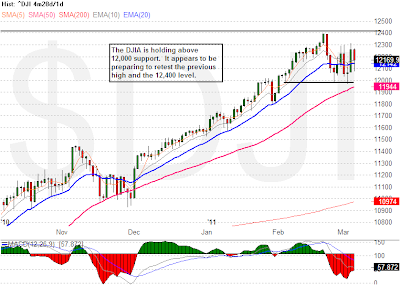 The market continues to be uncertain. While the equities market is trying to find support, GLD, the gold ETF is holding its strength to move above the 139/140 level. 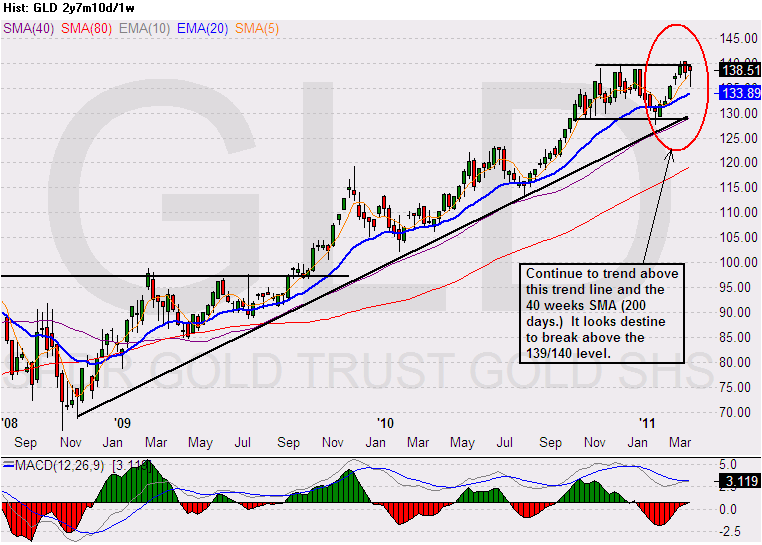 Looking at the weekly price chart for GLD, it is still trending above its 40 weeks SMA and its long term trend line. Whether it is the geopolitical issue in the Middle East or the natural disaster in Japan, gold is showing strength it is heading back toward 139/140 resistance level. 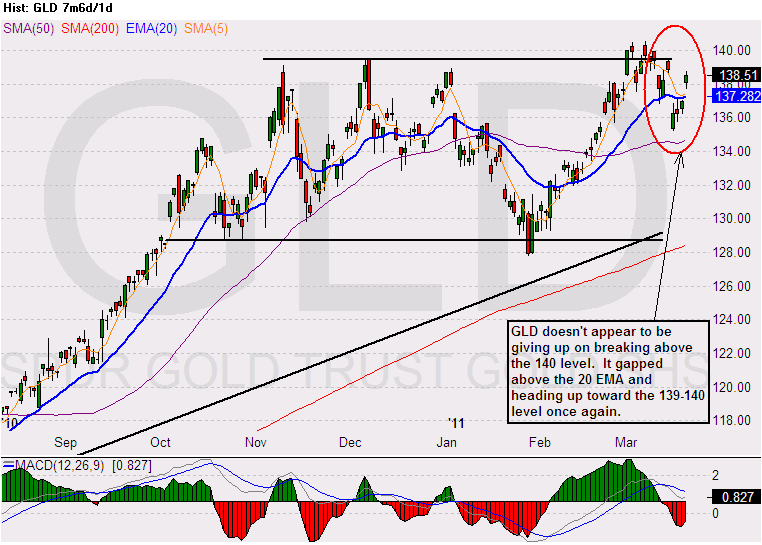 I will be watching GLD to break the 140 resistance soon. 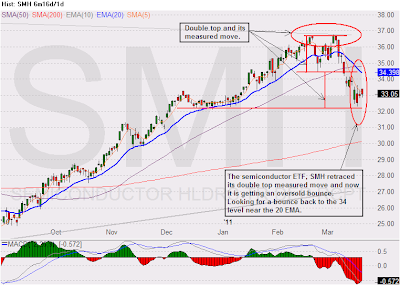 On the flip side, the semiconductor ETF, SMH is facing more downside pressure due to the earthquake in Japan that could potentially cause a shortage of raw silicon wafers for the world chipmakers. 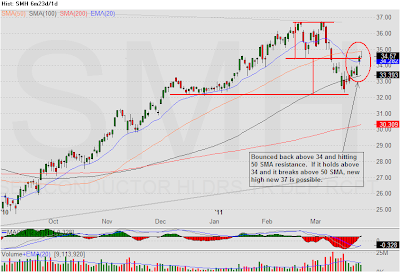 Even before the earthquake in Japan, the SMH has already formed a double top and started its retracement. 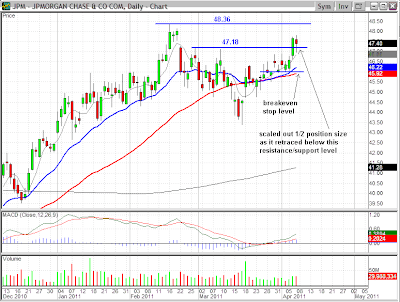 Last week, it has retraced the double top measured move. 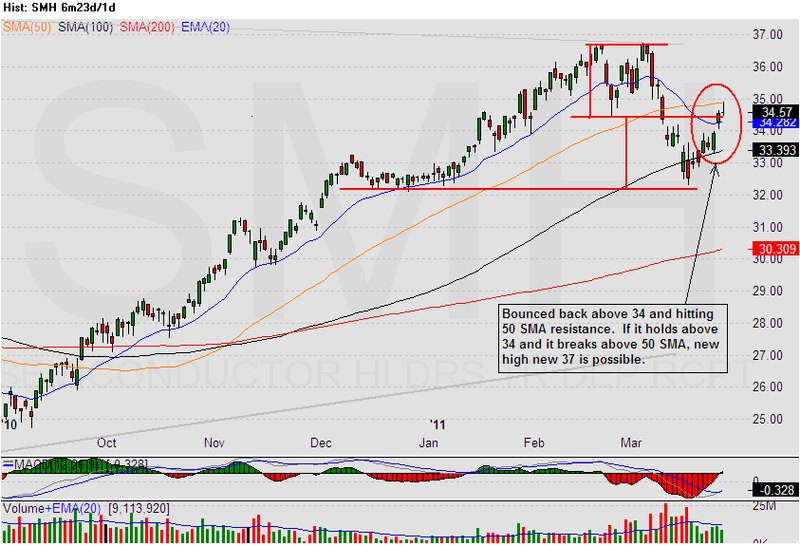 As the situation in Japan stabilize next week, the SMH could experience an oversold bounce back to the 34 level near the 20 EMA, then it will most likely reverse back to its downtrend. The natural disaster in Japan will undoubtedly have an effect on the supply chain for many technology companies. 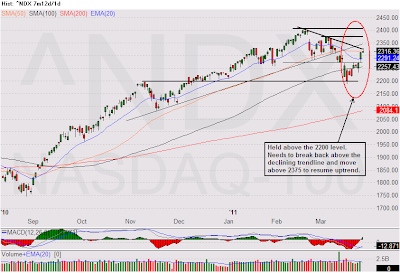 This will cause some tech companies to reduce their quarterly projection and will put additional pressure on the Nasdaq 100 in the short term. 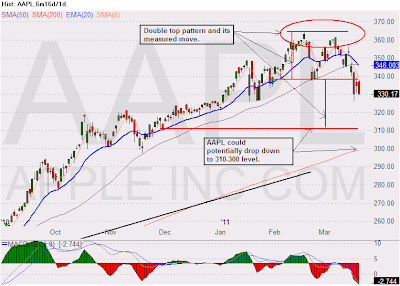 One of the company that could adversely affect by the Japan earthquake is AAPL. If it cannot source just one component for the iphone or for the ipad due to its Japan supplier manufacturing interruption, then its production of the iphone and/or the ipad will come to a halt when the component inventory runs out. I don’t think it takes a genius to figure out the current market is news driven. But I know I’m not smart enough to know which news event is currently driving the market, or will drive it tomorrow, on the next day, and so on. What I know is whatever the news that is driving the market, it is reflected on the price, which is why I keep my eyes on the price action. Here are a few current news event: ‘Potential nuclear meltdown in Japan’, ‘Middle East unrest could interrupt oil production’, ‘EU financial meltdown’, ‘Potential inflationary pressure from US deficit spending’, and more. Which one of these or other events is going to drive the market tomorrow, and how will that news event affect the price movement, up, down, or sideway? I will be the first to admit, I don’t know, I don’t pretend to know, and I will never know (and the truth is, no one will ever know!) That is why I keep my eyes on the price, because whatever it is it will ultimately reflected on the price. With so many headwinds that can move the market, I don’t waste my time trying to figure out which news is moving the market. 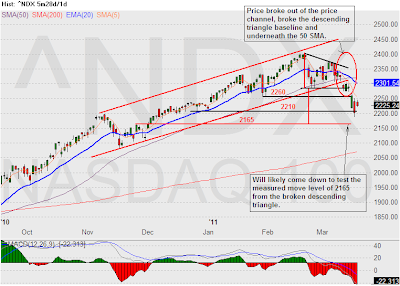 Instead, I look at the price chart of the SP500 and the Nasdaq 100, see what these two indices are doing and prepare for the next potential move. In a heavily news driven market, sometime it is best to stay on the sideline than go in and get chopped up. If there are too many counteracting news, I just move to the sideline. 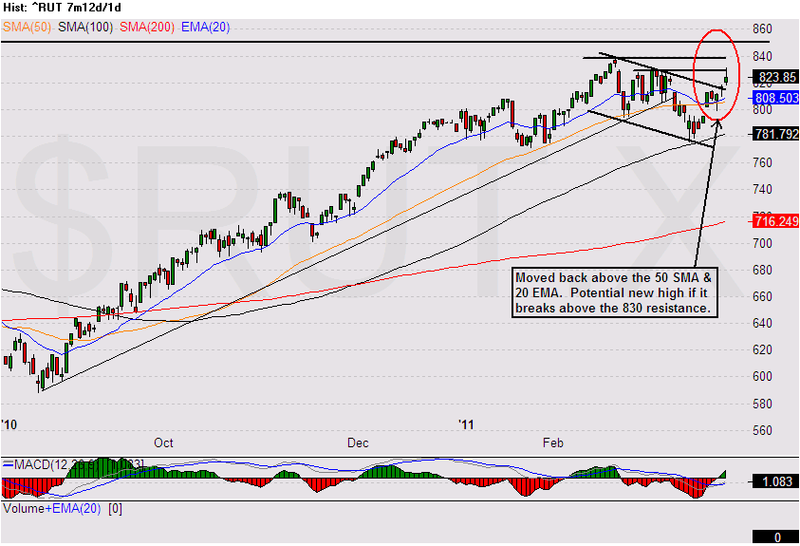 Presently, the price actions from the following charts are telling me to remain bearish. Whew! UCLA pull off a nail biter. Go Bruins! As I am writing this, the Nikkei 225 is down almost 500 point or 5%. This seems to be a reaction to last week’s disastrous earthquake in Japan. How will the drop in the Nikkei affect the U.S. market tomorrow is anyone's guess. 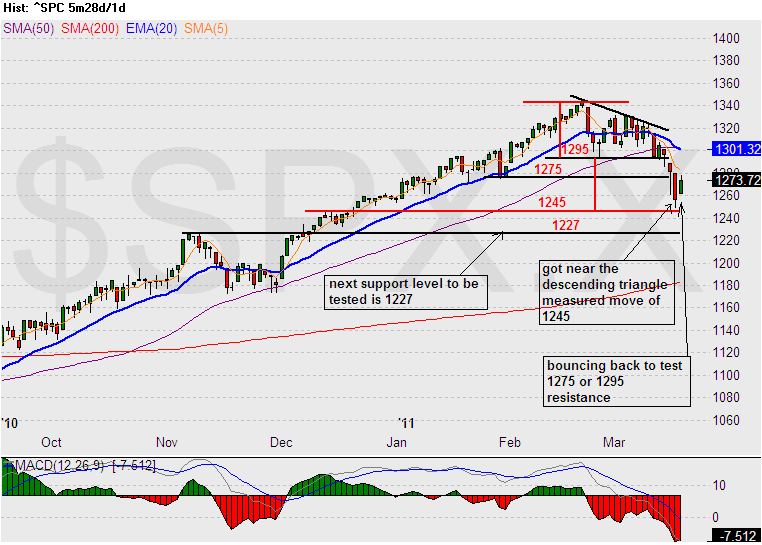 In the meantime, the SP500 came back down to retest the 1295 after it has failed to get back above 1330. 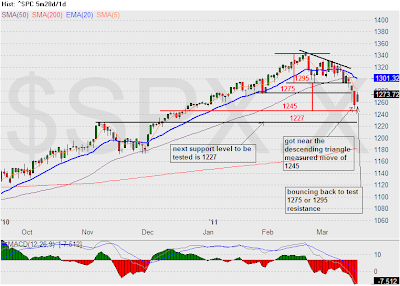 In the last trading session, the SP500 open below 1295 then bounced back above it and closed at 1304.28. The recent price actions from the SP500 appear to be forming a descending triangle with 1295 as its base. 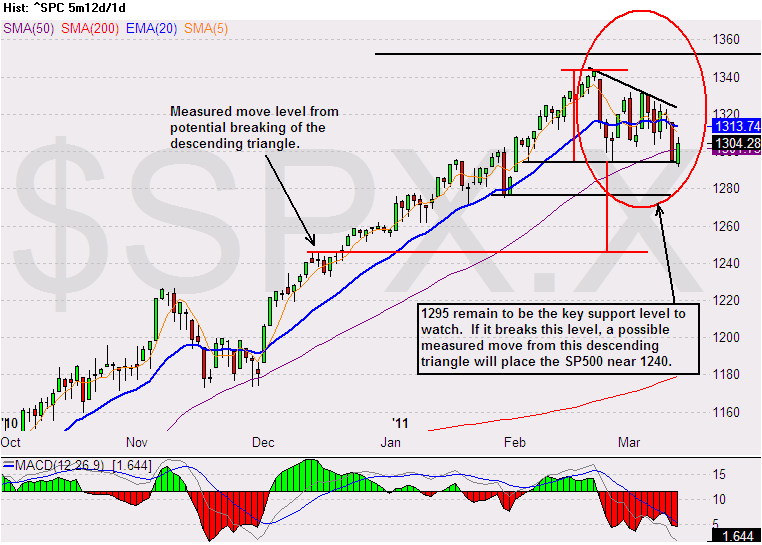 If it breaks this base, the measured move could potential place the SP500 down near the 1240 level. Next week is another OpEx week, and with the disastrous earthquake in Japan and the unsettled unrest in Libya, volatility will most likely increase. 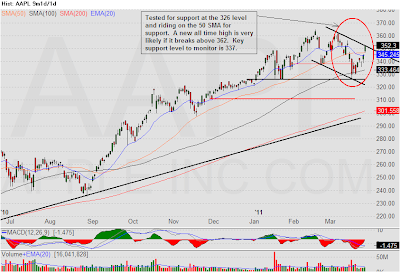 From scanning the chart for my list of stocks, lot of them are teetering on holding their support level and can easily flip over if the market breaks support. I am beginning to start looking at potential shorts while I am on the sideline. 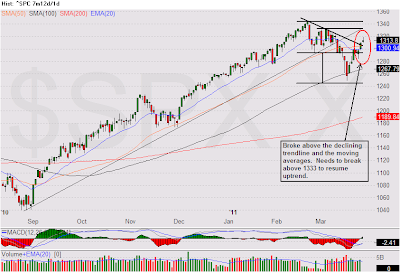 Here is an updated SP500 price chart, click on it to view the commentary and various key levels. 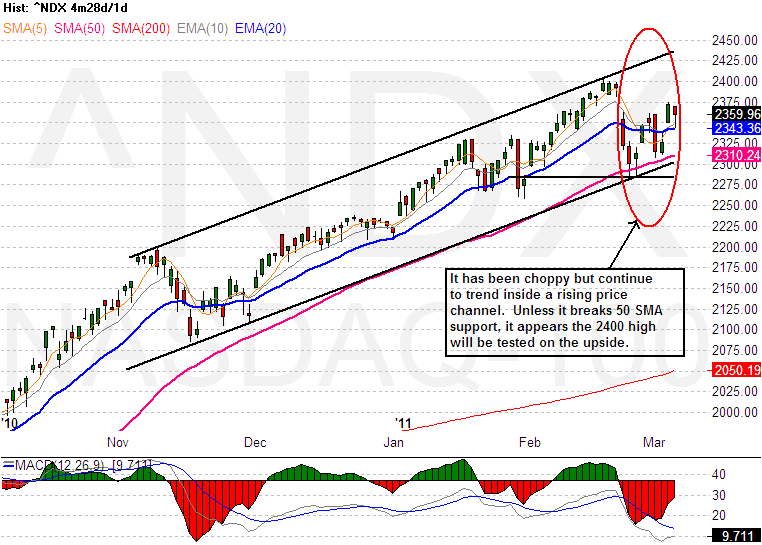 The market continues to be choppy and holding support. 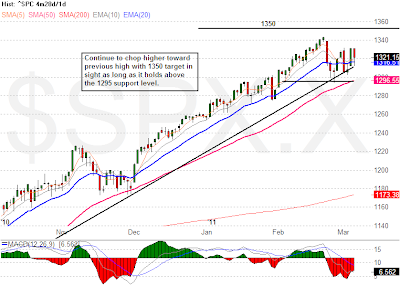 The market indices are rebuilding their strengths while they grind higher to go retest the February high.